Welcome to my trades/sales thread! As of this edit, I'm mostly looking to trade my extras for some of the stuff in my wants list, or to just sell them via PayPal. Master Set: Heroscape The Conflict Begins - used but almost 100% complete: It is missing the warehouse upper level piece as well as a single concrete hex piece. Please PM, post, or email me at BuffaloHeroscape@gmail.com if you are interested! ...and probably at least 3 more that I can't remember/have no proof of. Last edited by brandonwiker; April 7th, 2019 at 09:17 PM. Re: Looking to purchase Fire Elementals! Bumping, just updated: I wish to purchase some fire elementals, please PM me with offers (quantity and price per fire elemental.) I'd prefer to buy at least 3 from a single person to save on shipping. I have 0, and I am looking to buy 5-6. Doesn't mean I'm not flexible, though! Last edited by brandonwiker; June 10th, 2016 at 09:57 PM. I had a good transaction with brandonwiker and would gladly deal with him again! I assume you want the official figures, perhaps for tourney play, but there are some nice proxys from HeroClix. Fragments-???? from the Phoenix set. I picked up a half dozen or so for a $1 each. I want official figures, but I am considering proxies. 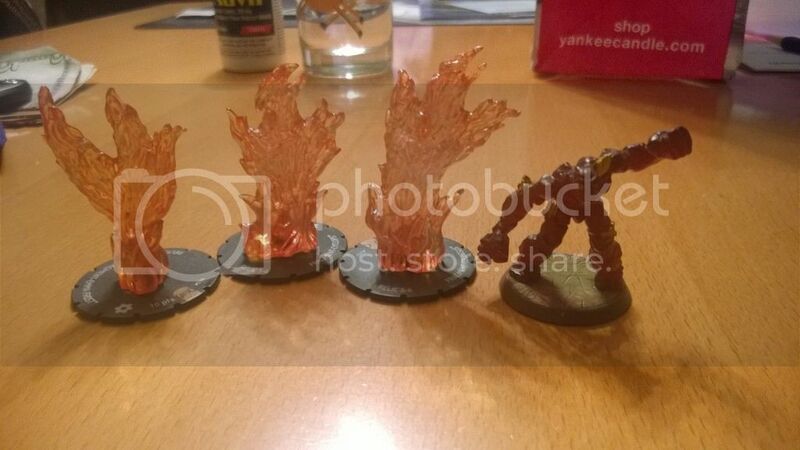 Those look good, I will consider them if I can't get my hands on some official fire elementals over the next month or so. I will 2nd that the Heroclix "Fragment" figures are pretty cool. And they are fairly inexpensive (around $1 - $2) from Troll and Toad. I'm using them to make a custom Common Squad. Bumping! Updated with a few scape items for sale, and added some to my want list.